The 113-mile drive along US Route 1 from mainland Florida to Key West is one of the most unique drives you can do in the USA. Besides the natural beauty along the route—tidal flats, teal waters dotted by distant islands—the so-called Overseas Highway awes you in its own right as an engineering marvel. Its concrete stretches across impossible expanses of water, the Atlantic spreading out to the left, the Gulf to the right. It is easy to understand why the southernmost leg is often referred to as the "Highway that Goes to the Sea." In fact, en route to Key West you'll encounter an astonishing 42 bridges over open waters of the Atlantic Ocean, Florida Bay and the Gulf of Mexico. From the top of some of these bridges, the individual islands in the distance look tiny and fragile against the sea and sky. 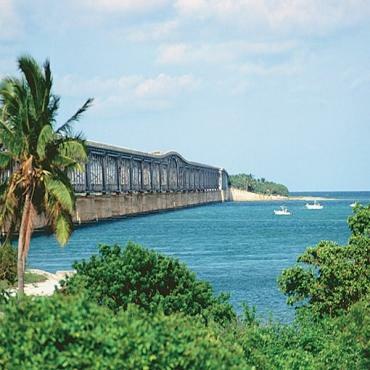 A true highlight of this route is to drive across the incredible Seven Mile Bridge, nothing but sparkling sea and deserted islands surround you. Take your time and stop as often as you like. There are no schedules to keep to in the Keys, so enjoy the journey and the view! There are a number of dive and snorkelling sites including the way too: John Pennekamp Coral Reef State Park, Tavernier, Duck Key, Hawks Cay and Islamorada. This is life on the water at it's finest!